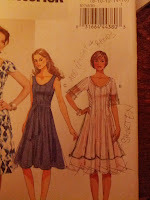 My Frocktober dress started as a doodle on the pattern envelope garment renderings. In my many years of collecting vintage patterns I ran across many notes and names and other useful info about the pattern and on a very rare occasion I have found additional drawings of the intended outcome of the garment. I always wondered how those doodles came about. I have altered and amended many patterns and never doodled on the envelope till this project. Without rhyme or reason I just pulled out the pattern and just started my doodle then I executed it, it was a different method but I might just start implementing it regularly. My fabric is a mid weight stretch denim with white pinstripes. I chose this pattern because I could adjust the grain lines of the pattern pieces to create visual interest in the fabric. I cut the bodice sides and center back on the bias to create a chevron effect. The added sleeve bands were also cut on the bias. To add to the detailing I chose decorative thick zigzag stitching in lieu of basic top stitching as directed by the pattern. Do you doodle on pattern envelopes too? Have you ever came across a pre-loved pattern envelope with garment modifications? This looks fabulous. I love your decorative top sritching. I may have to try some soon. Thank you, yes you should try it! This is beautiful! You should doodle more often because you turned your vision into an awesome dress! Thank you so much Carolyn, I will have to keep on doodling! 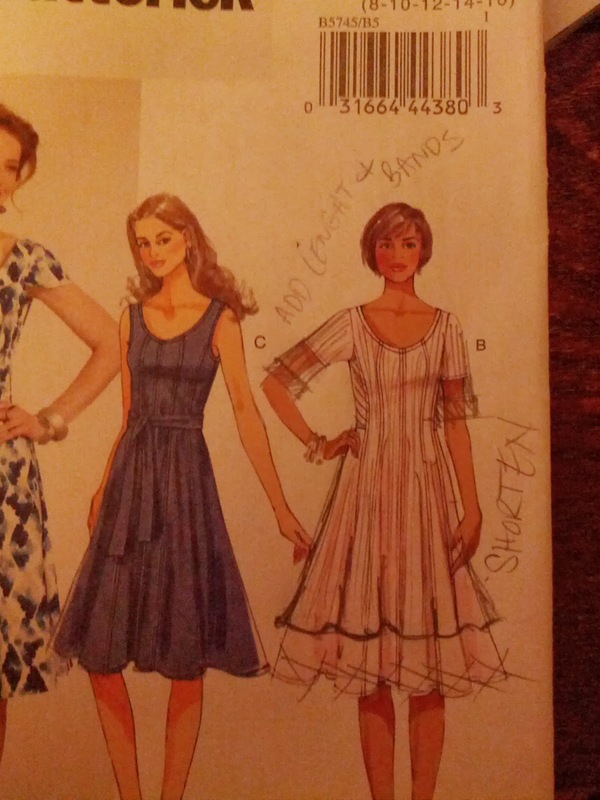 Your dress is great, I love the effect of a simple zig zag stitch as a top stitch. Thank you for your kind words. I am so happy to find your blog too!